is the Featured Item this week. Order this item and get FREE SHIPPING!! 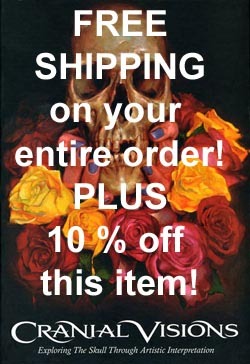 (FREE SHIPPING to US orders only. Shipping to Canada is $30.00 and anywhere else is $45.00. The fascinating and grim history of the skull has been a forceful subject matter throughout the ages. Maintaining prominence in the scientific and medical fields, it is also commonly interpreted through artistic endeavors, tracing back as far as creative collections have been recorded. This book features an immense volume of work which highlights the skull in all sorts of mediums, bringing together artists and works from all walks of life. Readers are invited to explore the fascinating and macabre world of the cranium-cetered theme. A spellbinding journey told through chromatically brilliant photos and words; this book is sure to awaken the mind and senses. Chapters Include: Tattoos, Paintings, Sketches & Drawings, Mixed Media, Digital Art, Graffiti, Photography, and Skullptures. Available now in a softcover edition.